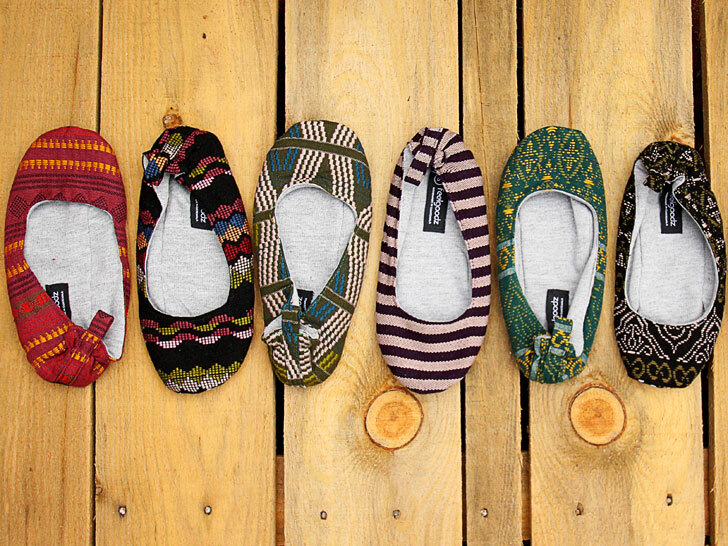 Known for its eco-friendly flip-flops, Feelgoodz is expanding its business into indoor ballet-style slippers. Fairly handwoven and loomed in Guatemala from vegetable-dyed natural fibers, the shoes are the brainchild of chief designer Lizzie Gonzales McTighe, who arrived at the concept while sifting through fabrics at an artisan studio in central Vietnam. Each Lizzieloom, according to Gonzales McTighe, is designed for “comfort, coziness, and consciousness,” whether you’re lounging at home, at the yoga studio, or in your hotel room on vacation. “Woven by hand, each unique piece tells their story,” she says. More important, you’ll “never want to go barefoot again,” she adds. Known for its eco-friendly flip-flops, Feelgoodz is expanding its business into indoor ballet-style slippers. Fairly handwoven and loomed in Guatemala from vegetable-dyed natural fibers, the shoes are the brainchild of chief designer Lizzie Gonzales McTighe, who arrived at the concept while sifting through fabrics at an artisan studio in central Vietnam. Each Lizzieloom, according to Gonzales McTighe, is designed for "comfort, coziness, and consciousness," whether you're lounging at home, at the yoga studio, or in your hotel room on vacation. "Woven by hand, each unique piece tells their story," she says. More important, you'll "never want to go barefoot again," she adds.